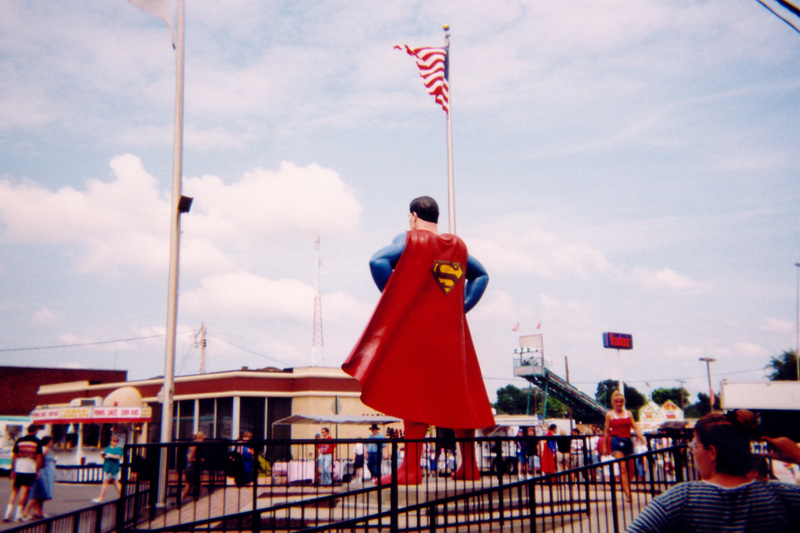 It’s kinda amazing just how much the Superman Celebration in Metropolis, IL has grown over the years. My first trip up to the celebration was in 1999 with my friend Dave Beaty and his family- Ron, Jane, and Ronnie Shenks. It was just a day trip up on Saturday for us, and for the next few years we continued to do so every second weekend in June, and each year we’d bring more friends with us. 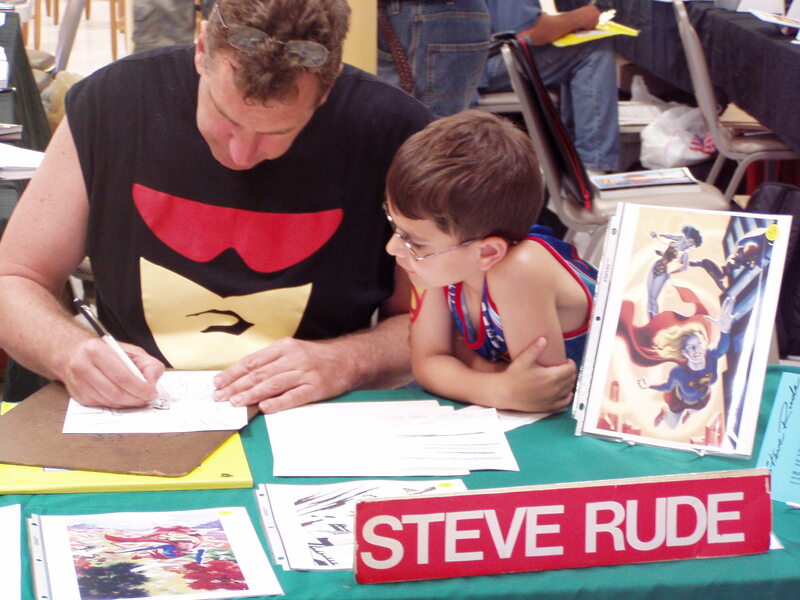 I ran into Steve Stanley again the following year in the Metropolis Chamber of Commerce while I was in line for autographs from Jackson Bostwick/Shazam, Lou Ferrigno/Hulk, Scott Cranford/Superman, and Noel Neill/Lois Lane– my friend and writer Eddy Zeno was a guest, too. Steve asked me if I’d like to be a guest. 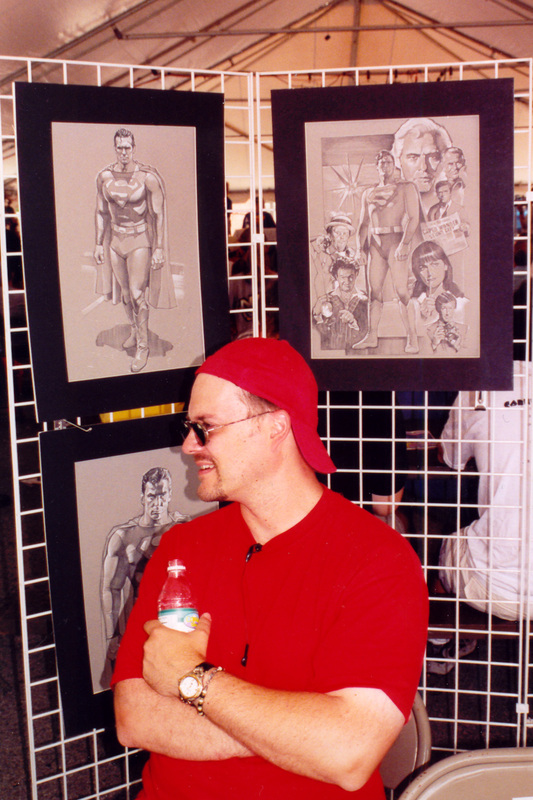 Since I wasn’t a Superman artist I was a bit shocked, but Steve had seen some of my airbrushed work and I was just really starting to get back to work on the Bushi Tales comics at the time. We traded contact info before I had to keep the line moving and head out. We kept in touch over the next year and I started communicating with Karla Ogle about appearing at the Celebration. 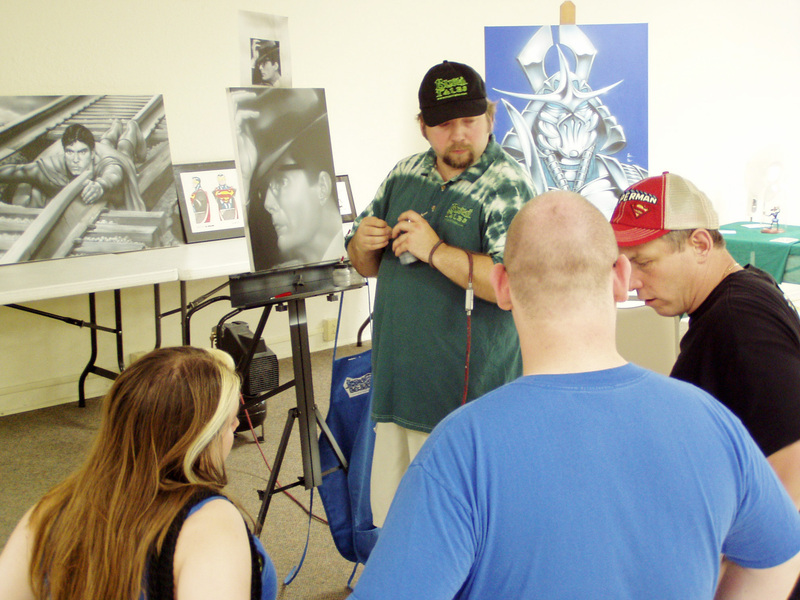 We each had a couple tables, did our song and dance about how to do art, and I did some live airbrush demos. Kevin Williams and Muley kept folks entertained, too. Kevin had come up to help me watch my table in case I got “busy”. It was slow and Steve (later to be know as “Cake”- but that’s another story!) was concerned we might be missing art sales, but the building had great A/C. I’d seen what the heat outside could do to a better man! It also had a full kitchen, two restrooms, and a stage. I was happy and comfortable. I told him that once folks found out about our set up and the A/C they’d find us- especially the folks in costumes and ones not accustomed to the Metropolis summer heat. For once I was right! Word got out and we were seeing more and more people and families visit our space. Karla Ogle and the Superman Celebration staff were happy with what we’d done at the community center and asked if we’d like to come back and what could be done to make it even better. We told them we’d like to make it more of an artists alley. 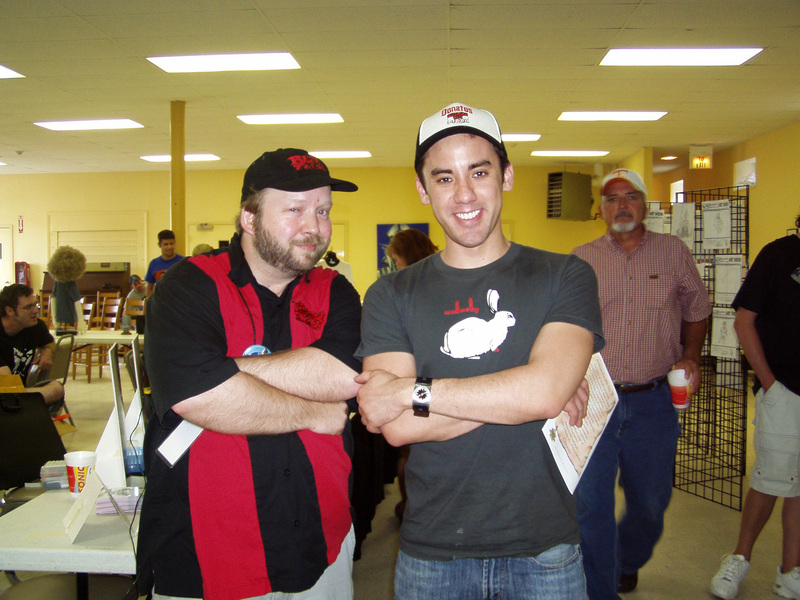 They asked if we had artist friends who would like to come up, and we replied, “Yes we do!” Kevin and I rallied some of our MidSouth Cartoonists Association members together and made plans to set up again there with Steve in 2006. We’d brought members of the MSCA and the “Memphis Mafia” with us and they brought a lot of their indie comics and enthusiasm. I did some more original airbrushed art and finally had copies of my Bushi Tales comics available. The Celebration invited back “The Dude” and writer/editor Marv Wolfman joined us there. The crowds continued to grow over the weekend. 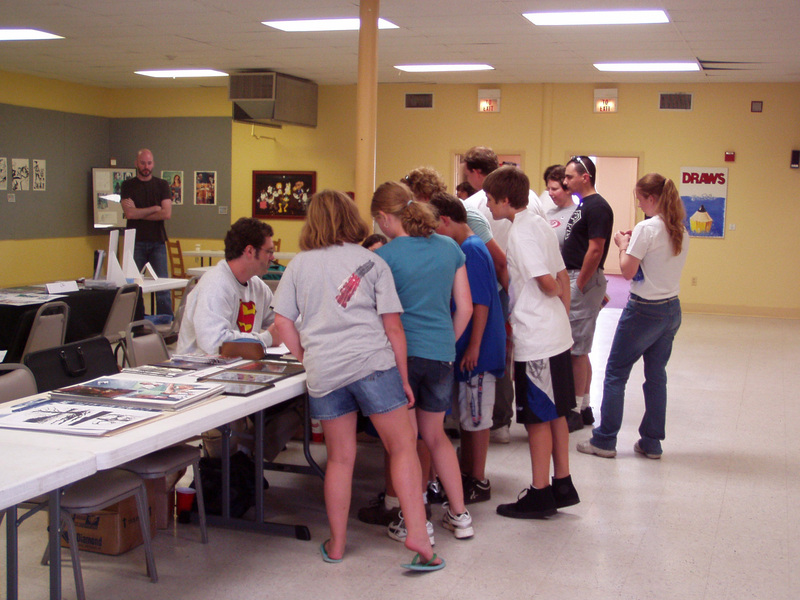 The community center had become Artists Alley and Artists Alley had become a happening place! 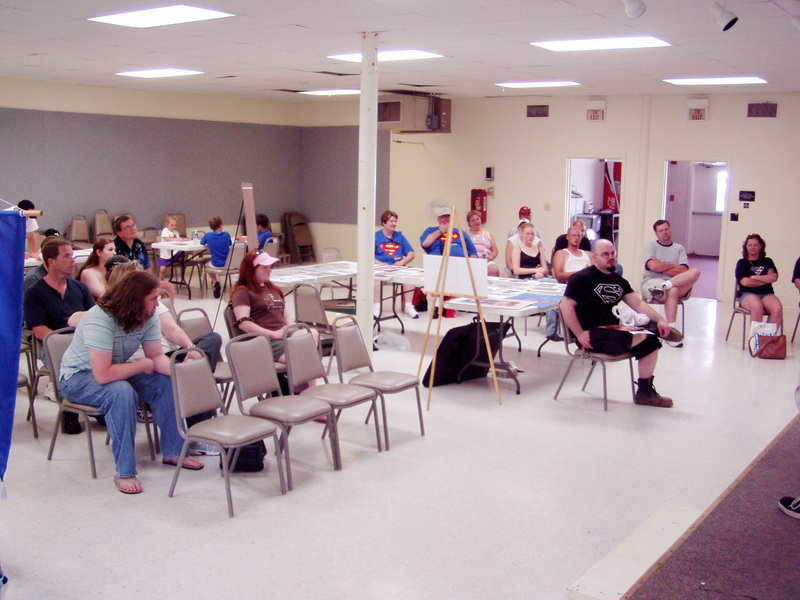 We had more comics seminars, an art show, art contest, freebie promos from DC Comics, and more folks enjoying the A/C. 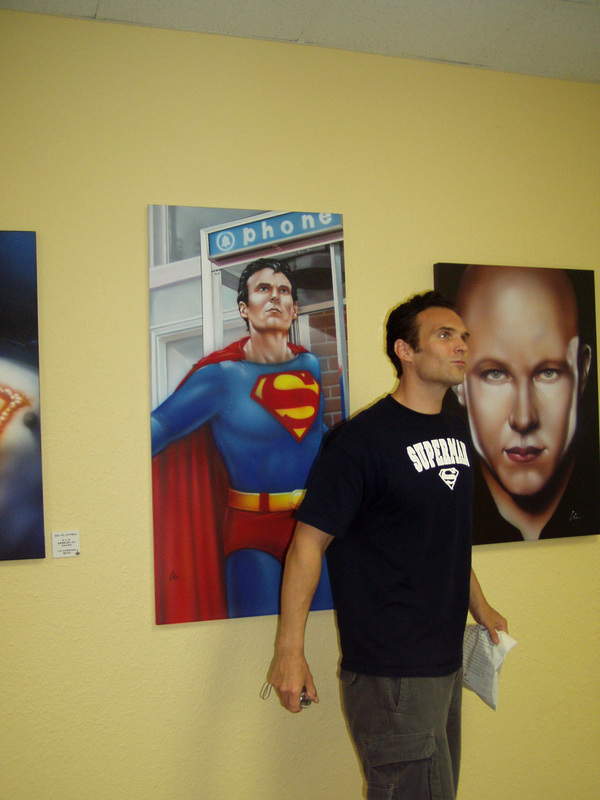 Even Superman Returns screenwriter Michael Dougherty stopped by to check it out. Scott Cranford, the official Superman of Metropolis told me, “I think you’ve created ‘the place to be’ in Metropolis.” That made us feel really good. 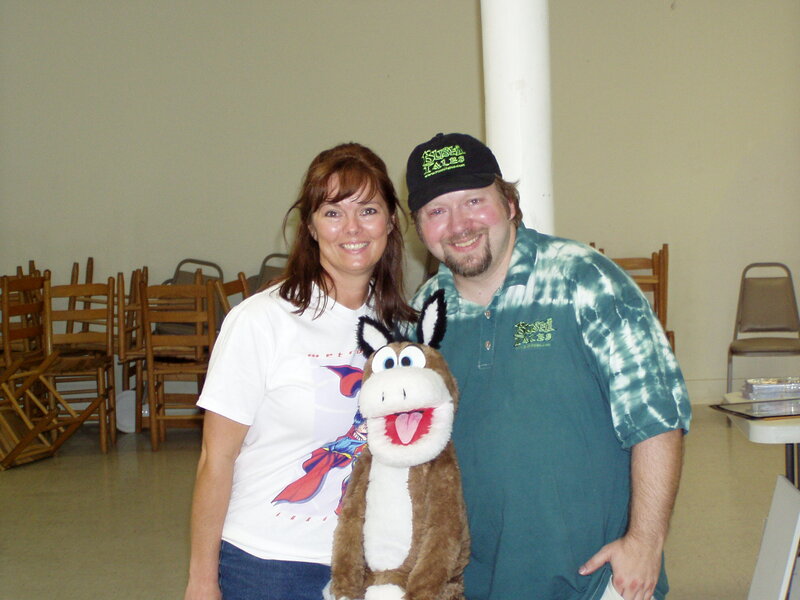 The next year, 2007, we had more of the “Memphis Mafia” join us, guest artist Jon Bogdonave, writers Len Wein and Jake Black, local artist Jay Chuppe from across the bridge in Paducah, KY, and Mole-Man/Munchkin actor Jerry Maren and his actress/stuntwoman wife Elisabeth Barrington. We actually started to have lines for autographs! People were wanting and waiting to get into Artists Alley…success! One thing we noticed the past two years was that there wasn’t much of a night life in Metropolis other than the auction or casino. At night the streets were pretty empty. The vendors closed up for the night. Folks went back to their hotels, the casino, the auction dinner, across the bridge to Paducah, or just left. 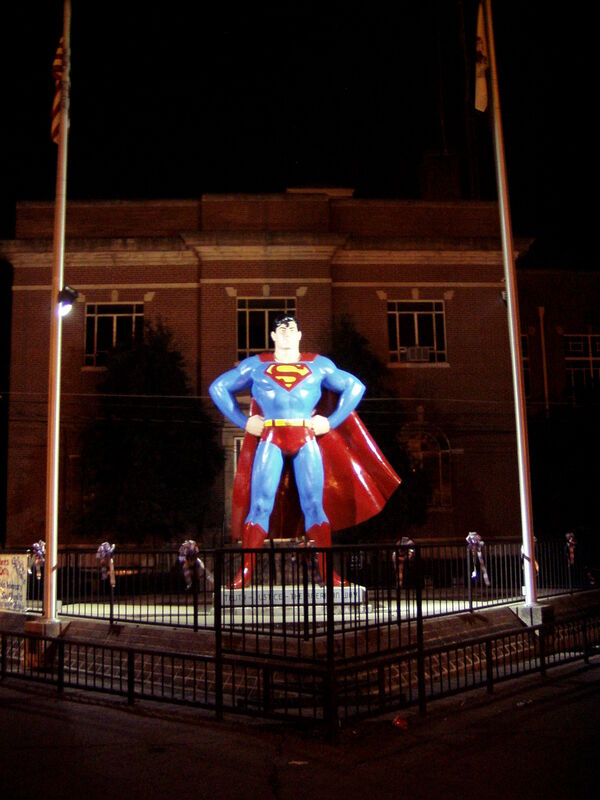 Superman was left standing alone to keep an eye on Market Street while the rest of the town slept. Since we had the building and could stay open as late as we wanted we began to think of ways to entertain folks after dark- and on the cheap. We ended up holding an open house and “block party”. Steve wanted it to be free and open to the public. We ran down to the store, got some drinks and munchies, cooked up some hot dogs, decorated, and invited as many people as we could- especially those with kids. It was a chance for the whole family to wear costumes in the A/C, mingle with other super-fans, and win some door prizes. One of the “Memphis Mafia”- Tim Brown, had an idea to add fan films to the mix. We showed the Super-Muley short we made, another fan film with Scott Cranford in it, and many others including Batman: Dead End which was given to us at Midsouthcon by our friend and stuntman/SPFX artist Dragon Dronet. Inbetween fims Kevin, Muley, and Stephanie Perrin gave out door prizes. The next year we called for fan film submissions and Tim created the Superman Celebration Fan Film awards. We just had the 5th annual awards this year! 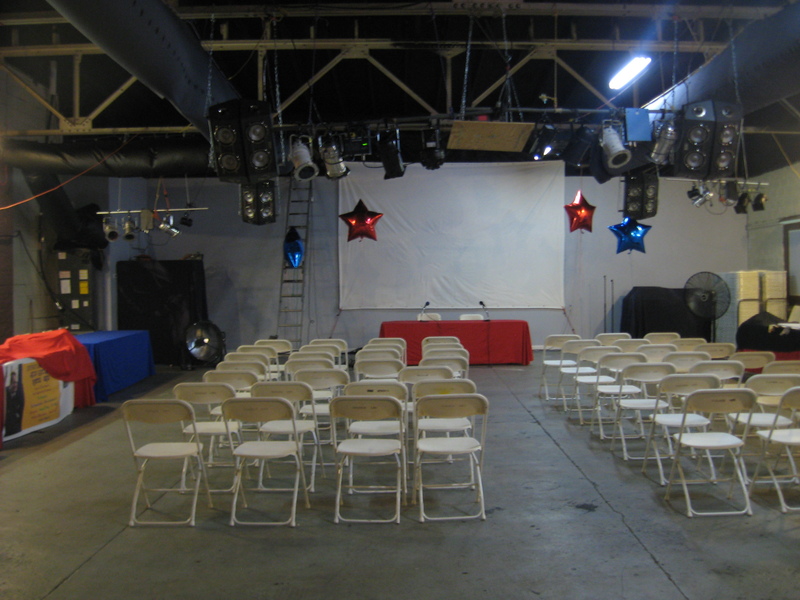 In 2008 we moved up Market Street to the Four Rivers Church, next door to Thor’s Gym. Even though we had more space, we were worried folks might not find us easily- and we were going to miss the awesome A/C! Luckily Karla and her sister Lisa (co-chairs of the Celebration) both liked what we had done at the previous location and wanted to continue with the “block party/open house” ideas. They also provided us with two of our best volunteers- their parents! Papa Cliff and Mama Wanda have been a blessing to be around ever since! The chamber helped supply us with snacks for our after hours events. 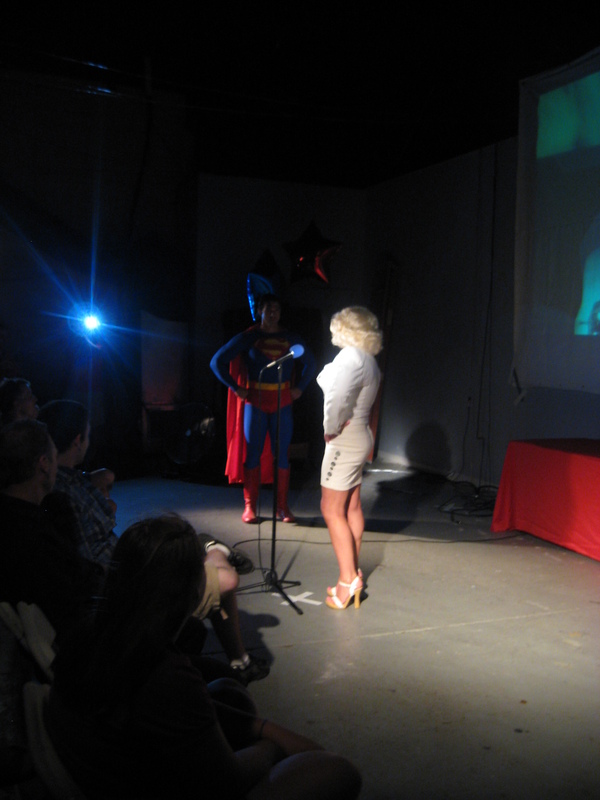 This time we did fan films and first awards ceremony on Friday night, and a movie night on Saturday- Superman: The Movie! 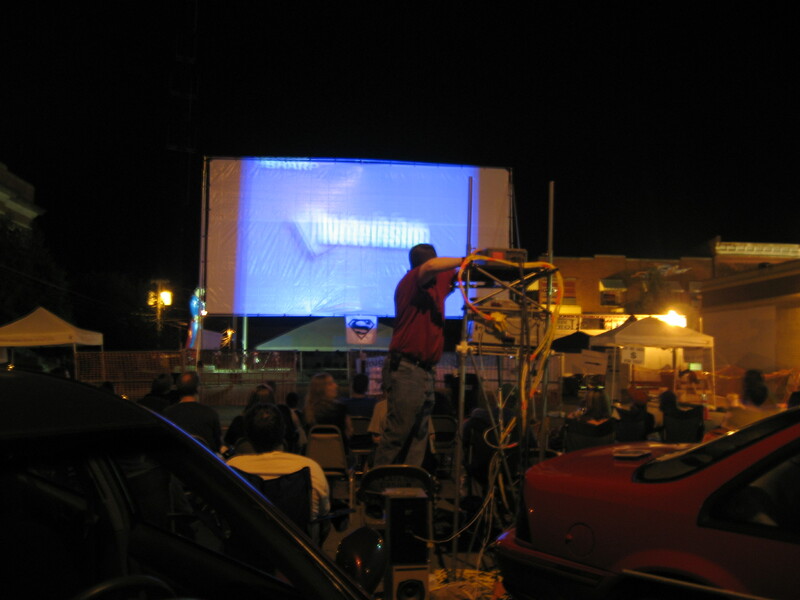 Tim Brown and Muley both provided tribute videos of Christopher Reeve before the movie. Along with the “Memphis Mafia” usual suspects and Jay, we also had my Bushi Tales co-horts Dave Beaty and Micah Stewart there, writer Josh Elder, writer Eddy Zeno, editor Michael Eury, comics legend Murphy Anderson and his wife Helen, and many more join us. But something was missing, or should I say “someones”- Steve Stanley and Scott Cranford. 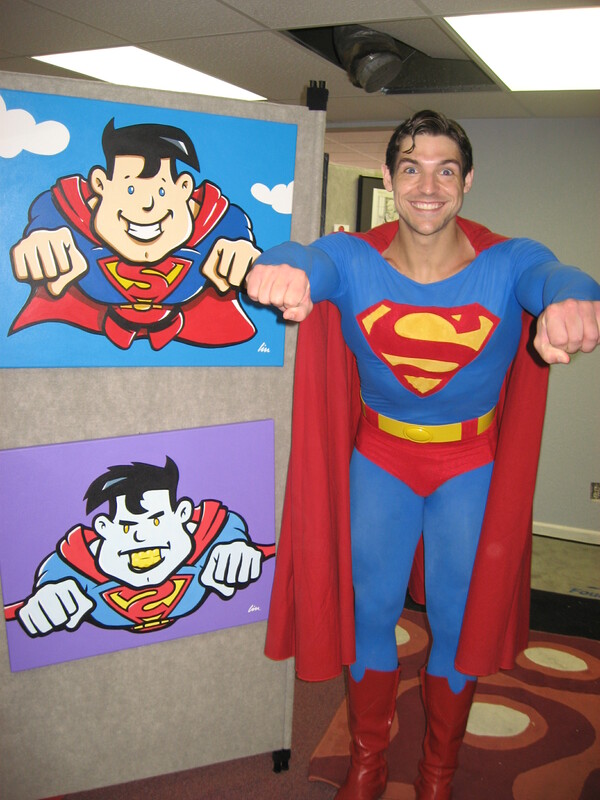 There was a new Superman in town- Josh Boultinghouse who had won that year’s search for Superman contest. 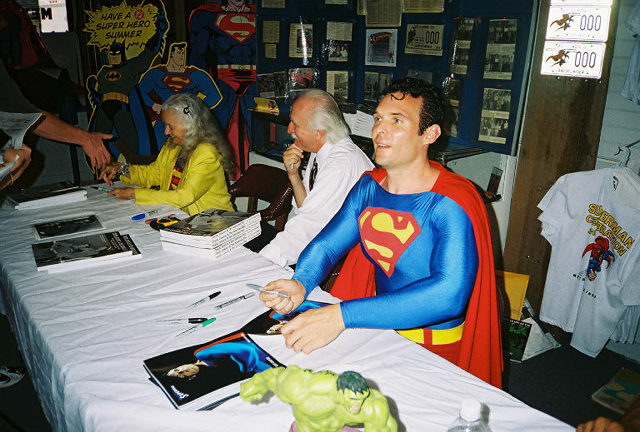 He made stops by Artists Alley on his daily rounds of Metropolis, an was always happy to pose for pics and talk to fans in town. We also expanded the art show that year and used new panels to display. I didn’t realize just how much my new toons looked like Josh! 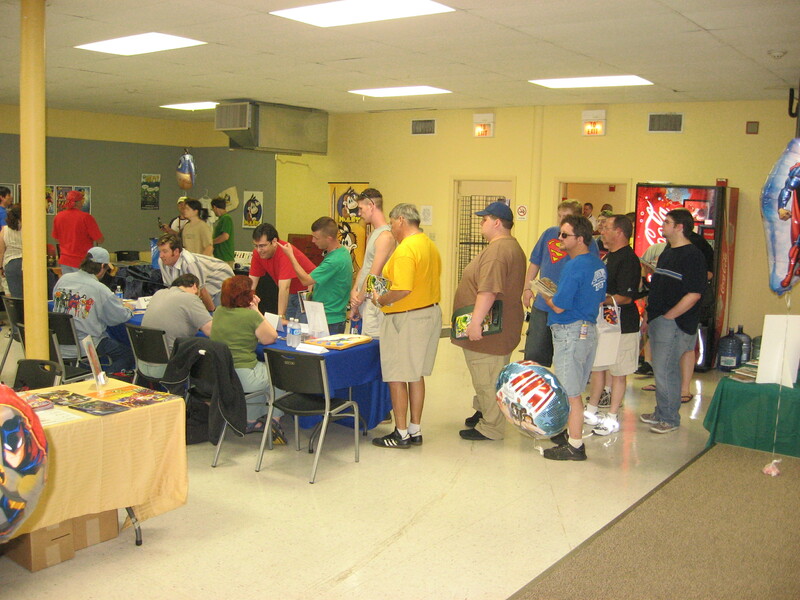 By 2009 Artists Alley had become Artists Alley and Writers Way, and we were joined by artist Mike Norton, writer Gail Simone, writer John Ostrander, his wife artist Mary Mitchell, and actress Beverly Washburn. That year on Friday night we did a tribute to Lois Lane actress Noel Neill which included some vintage footage of Noel and a couple episodes of The Adventures of Superman TV show. I was lucky enough to have Tim talk me into being the emcee for Noel’s tribute and I had a blast talking to her and her biographer Larry Ward (who know is known as “Jeffrey”- but that’s another story). 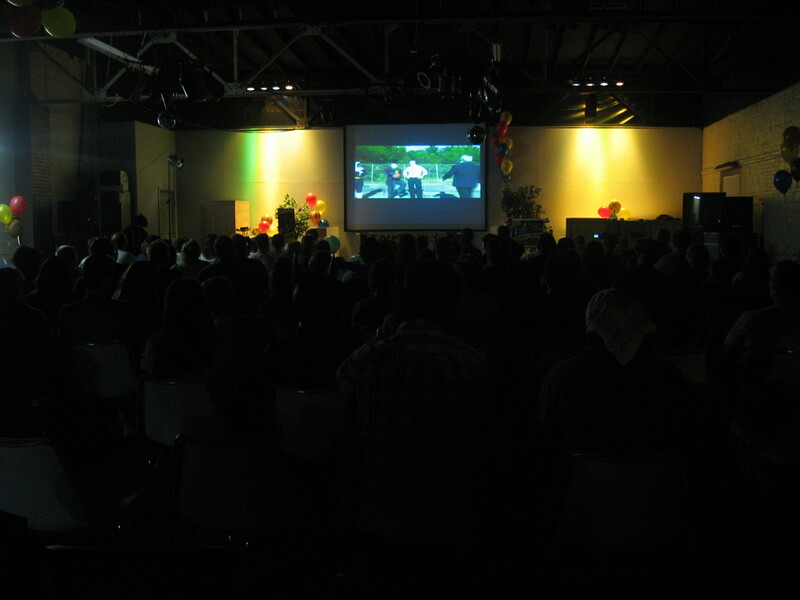 Later we had a special viewing of the fan film The Red Mullet. 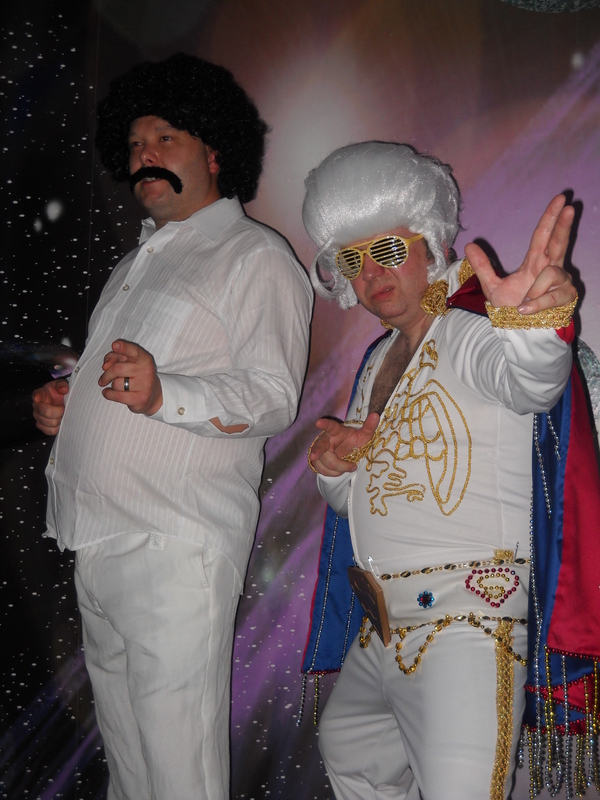 Costumed Dance Party– oh, yeah!!! Timmy did an awesome job on lights and sound. It was a big hit. Lots of cos-players, a lot of fun- and I got to dance with Nicki! We always enjoy a good con dance party and it’s been a Superman Celebration Saturday night tradition ever since…and nighttime has never been the same in Metropolis. Since we’ve literally have seen a big growth in the amount of folks on Market Street at night, as well as a big amount of vendors staying open later, and later. Which means more opportunities for me to get a corndog and hang out with friends on the midway! 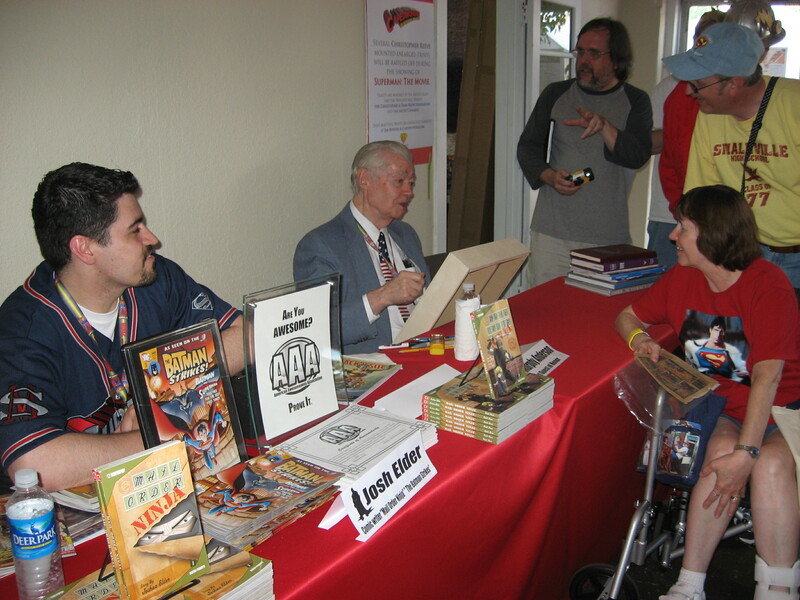 In 2010, some of the MSCA members were missing, but we also had a couple familiar faces come back to join us- Dave Beaty, Josh Elder, Trevor Hawkins and comics legend Carmine Infantino! We also had movie producer Ilya Salkind join us in AA/WW for the weekend and even intro a screening of Superman II. We wrapped it up with another successful Fan Film Awards and dance party afterward! This year Tim and I came up a day early on Wednesday to get AA/WW squared away and give us a bit more time to get things like we wanted before the Celebration opened on Thursday afternoon and AA/WW on Friday morning. I did a cartooning seminar on Friday and while I was teaching the basics this kid was using a magnadoodle to draw. I found out from his folks that he has autism and is deaf. 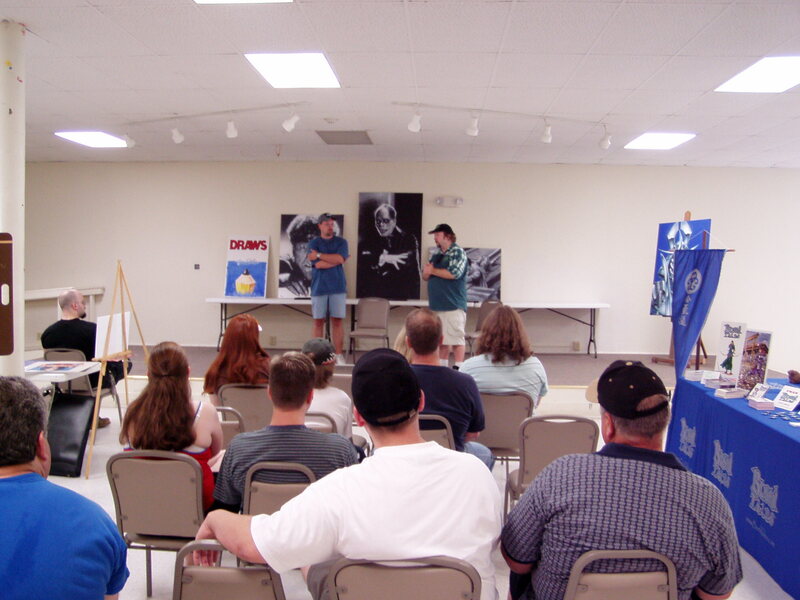 We talked about the “Assists For Autism” work I got to do with the Riverkings and the autism art show put on at the DeSoto Arts Council by autistic kids and some of the Riverkings players. …and Mark Pillow, Nuclear-Man from Superman IV. To be villains on-screen they’re really nice in person! 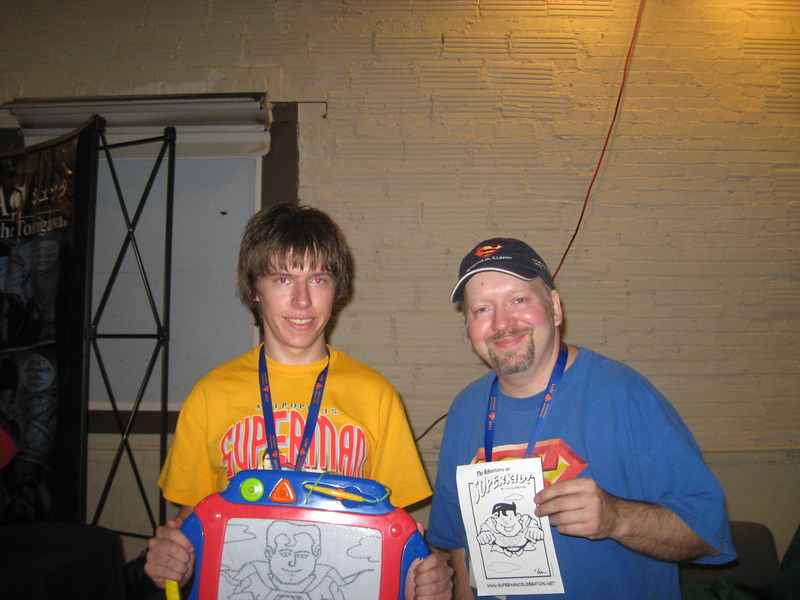 Tracy (with an appearance by Super-Josh) introduced a couple episodes of the Superboy TV show, and Mark introduced Superman IV. The next night Timmy and I got dressed up for the 5th Annual Fan Film Awards! 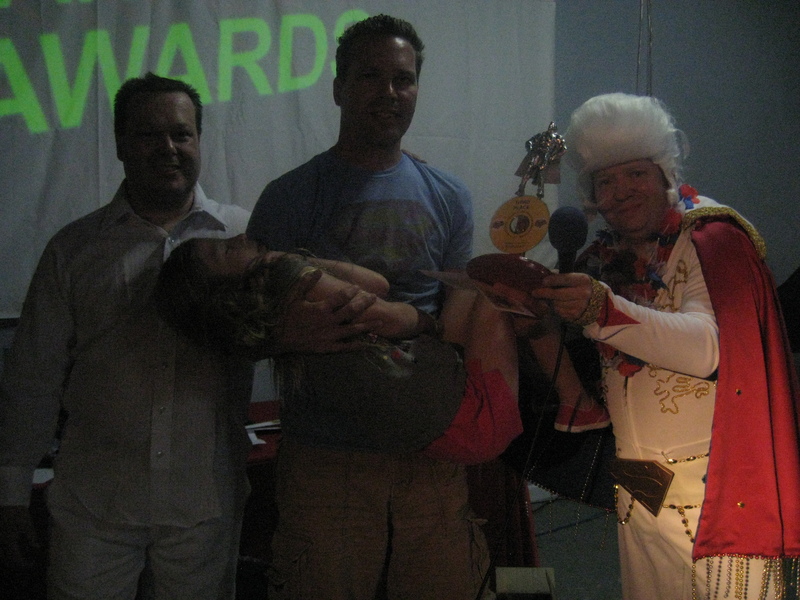 I performed as Jor-Elvis in the opening skit, and Timmy was my back up. He also provided the pre-recorded vocals and graphics/video. John Gleckler was the big winner- 1st and 2nd place! 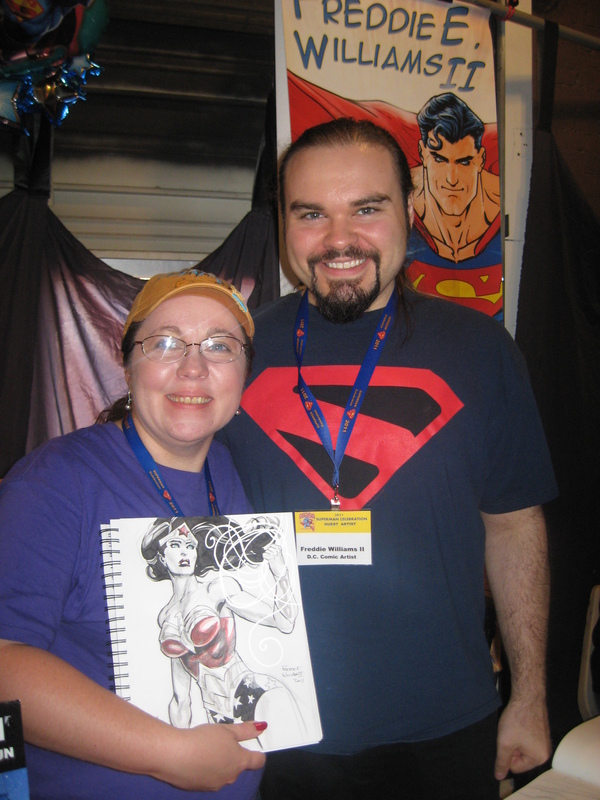 Third place went to Robb Pratt and the gorgeously drawn Superman Classic animated short. 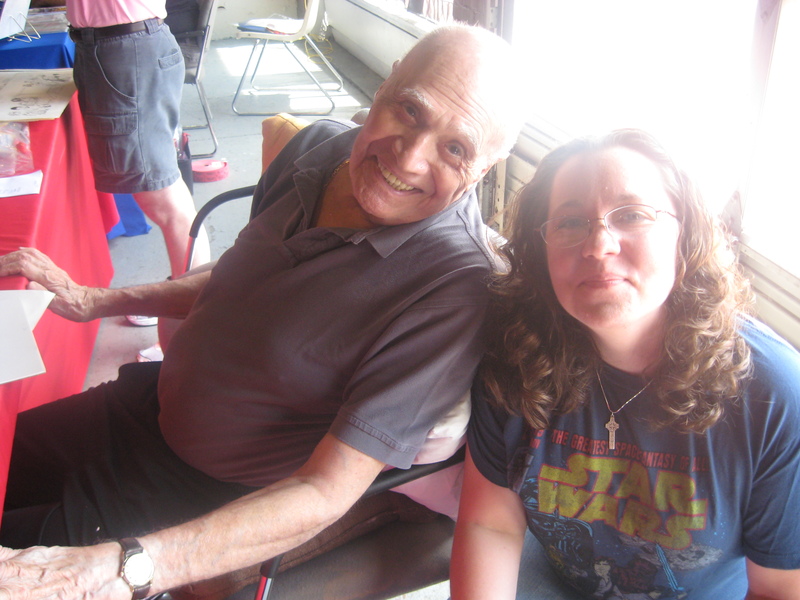 After the Fan Films we announced the winners of the “Save the Massac Theater” silent auction. This painting of mine was won by Mayor Billy! Earlier I got to go out on the midway on Market Street and get a footlong corndog and a lemonade. Guess you could saw I was a winner, too! And of course we finished up the night with the annual dance party! Thanks to Tim, Traci, Nicki, Karla, Lisa, Mama Wanda, Papa Cliff, Danny, all the Chamber Ladies and celebration volunteers, artists, writers, and comic fans that help make Artists Alley and Writers Way such a success every year. Hope to see you there again next year!